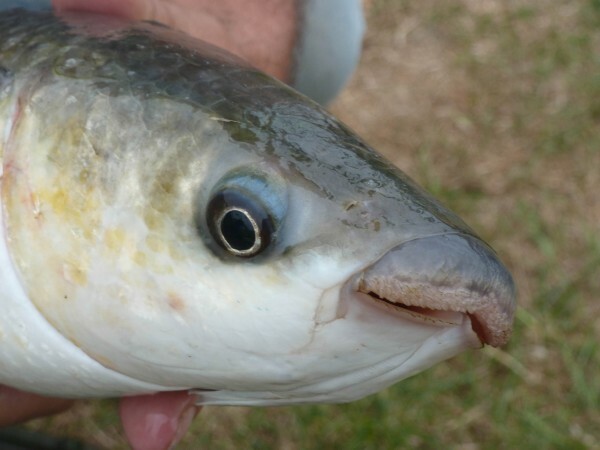 The business end of beautiful grey mullet – the estuaries are full of them at the moment so why not have a go yourself for this most under rated British sportsfish? After the success of our recent mullet fishing masterclass on the Sussex Ouse and now this trip report from one of my favourite Hampshire mullet marks I guess people could be forgiven for thinking that the Angling Trust has gone mullet mad over the last couple of weeks but believe me there really is a method in our madness. Sea anglers are a diverse and independent bunch and it has never been easy to get them to accept the need for a unified voice for angling or to sign up to a commonly agreed set of priorities. However, in my opinion, two organisations in particular stand out from the crowd when it comes to making the case for conservation and promoting sensible and sustainable fishing practices. These are the Bass Angler’s Sportfishing Society (BASS) and the National Mullet Club (NMC). Several years ago, when I was still gainfully employed in the House of Commons, I was invited down to Portsmouth to address the annual meeting of the NMC and to present their specimen fish trophies in my role as Parliamentary Spokesman for Angling. This caused much hilarity amongst the young women who worked in my constituency office as they envisaged their boss being surrounded by strange and unfashionable men with somewhat dated haircuts ! There is no doubt that while the guys I met that day were never likely to find themselves employed in the fashion industry they were a fine bunch of anglers who certainly knew how to practise their craft. In fact I was made most welcome and a number of the Club members have become personal friends of mine. I’m also delighted that the NMC plays a prominent and thoughtful role on the Conservation and Access Group of the Angling Trust. It is not a huge jump from my staple diet of trotting a piece of bread alongside an over-hanging willow tree for chub and roach to doing the same in an estuary on an ebbing tide alongside a row of moored boats. For towrope brigade I suspect mullet will continue to be regarded as uncatchable but for any halfway competent coarse angler prepared to make the switch they represent a truly great new sporting prospect. In fact they have been described by some as the ‘British bonefish’, not just for the similarity of their looks but for their spectacular fighting qualities. I caught my first bonefish this year and believe me there is little to choose between the scrap you will get off both species. A bonefish hooked in shallow water may run out more line and a big mullet is more likely to smash your tackle around the nearest piece of structure but both of them share a marked reluctance to give up even when fighting under the rod tip. For me, mullet fishing has become a welcome addition to my fishing year and provides some wonderful sport, particularly when the rivers are running low and stale. In these conditions, which are prevalent at the moment, the chub and barbel can wait a while. After spending the weekend working on the Angling Trust stand at the Game Fair I was due a day off in the week. 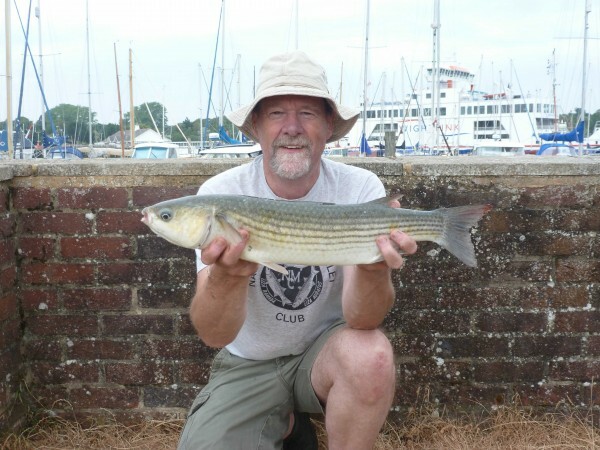 Nothing much was happening on either the Loddon, Kennet or Hants Avon and the tides where perfect for mullet on the South coast estuaries so the decision to head to salt was a no-brainer. Luckily, my friend and chairman of the Mullet Club Steve Smith also had a day’s fishing booked and so we agreed to meet at the marina just before high tide. 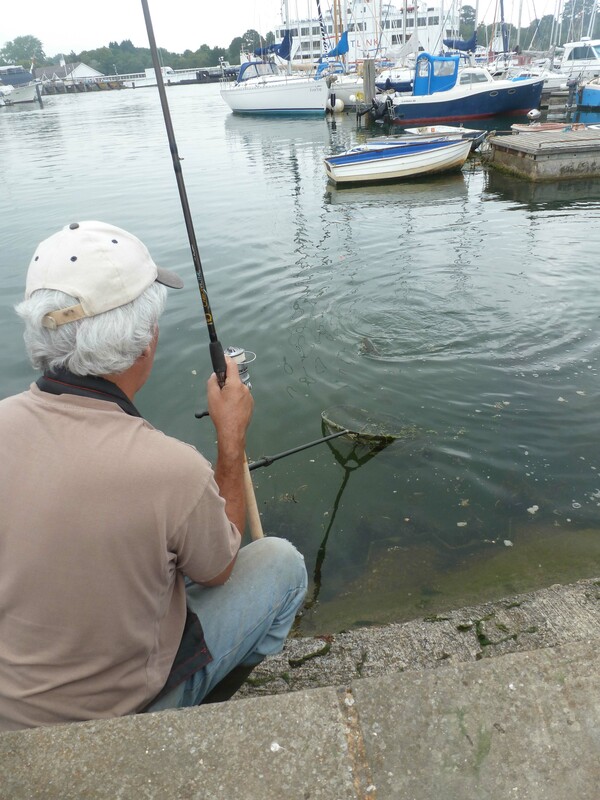 We were joined by the Angling Trust’s technical expert and former EA fisheries specialist Dr Alan Butterworth who has recently retired to the South Coast and who was keen to discover some local mullet marks. Mullet may not yet be a commercially important marine fish species but that doesn’t stop a significant amount of legal and illegal netting taking place in estuaries by licensed vessels, unlicensed vessels, ‘recreational’ netters and Uncle Tom Cobley and all. The bad news is that netting seems to be on the increase and is even occurring in supposedly ‘protected’ bass nursery areas with mullet being used as an excuse for hauling in by catches of juvenile bass. The end result is a desperately confusing situation for anglers about what’s legal, what’s not and to whom infringements are reported. 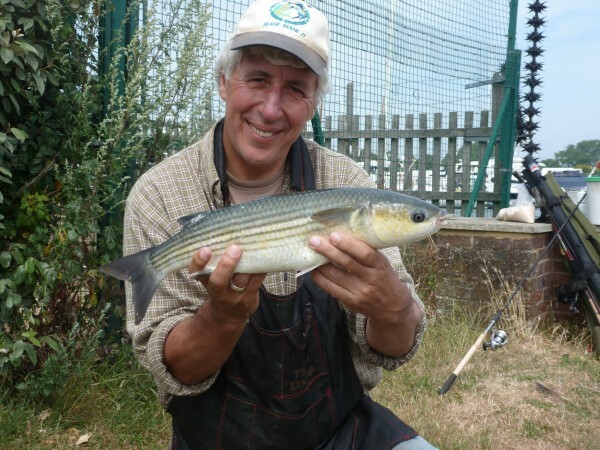 The Angling Trust and the NMC have been lobbying for mullet to be designated as a recreational only species but even this measure would only protect the species if introduced alongside much tougher restrictions on estuary netting. Watch out for a new Angling Trust campaign on this spearheaded by my colleague and marine campaigns manager David Mitchell in the near future. Steve Smith and Martin with one that the netsmen missed ! You don’t need a lot of gear for mullet, just a sturdy float rod a small fixed spool reel holding five or six pound floating line and a collection of crystal wagglers, puddle chuckers and loafers from the Drennan range. I favour an 0.13mm hooklink of around 4.12lbs matched with a 12 or 10 carbon chub hook or similar. I threw in a feeder rod just in case but I hardly ever switch from float fishing. I’ve been asked previously why a waggler rather than the more traditional top and bottom floats. The simple answer is that a waggler is far more versatile and is easier to use to present a bait at the variety of depths at which mullet like to feed. They move quickly up and down in the water column which is why I like to fish on the drop at half depth with ability to quickly slide the float up the line should I spot fish activity on the surface. Of course if the tide is ripping out and the fish are lying deep then a two to four swan loafer is just the job. Another good tip is to have two different types of feed available – one for surface and sub surface feeders and something a little heavier to get down further in the water column. This is why I will always have a bag of liquidised bread with me alongside the more traditional wet bread mash. And for binding up the bread mash believe me there’s nothing to beat old fashioned sausage rusk. The challenge these days is finding a traditional butcher who still makes his own bangers to buy it from. After some rewarding float fishing I switched to the quiver when water levels fell. I tried feeder fishing below the boats and downstream from Martin’s long trotting swim. As this yielded nothing and as the fish were active in the shallows I fished there depositing a carpet of fairly solid ground bait. Whilst winding in my feeder became snagged in old rope and I had to climb down the sea wall to retrieve it, cutting line in the process. I was just about to climb back up to retackle when a decent fish hove into view and started hovering up the ground bait just a few feet away. With me being out of action I called to Martin who quickly shallowed up his float, baited up and placed a perfect cast just behind the fish – close enough for its attention but not on top of it. I was about to offer directions but there was no need, the fish wheeled round in a tight u-turn and accelerated onto the bait. It was wonderful to see the float zip away, the rod bend and to watch as a great fight ensued with Martin more or less immobilised in the gloopy mud. This really was mullet fishing at its best. Sadly, Alan was too busy taking photos to land any of his own but being locally based he announced a clear intention to come back to the spot to catch a few over the coming weeks. So why not give mullet a go? This is a small island and very few people live more than a 90 minute drive from an estuary, tidal creek, seawall or pier. Standard coarse tackle is all you need but remember to wash down your reels afterwards or the salt will destroy them in no time. No special baits are required, they feed in the middle of the day and fight like stink. What’s not to like? 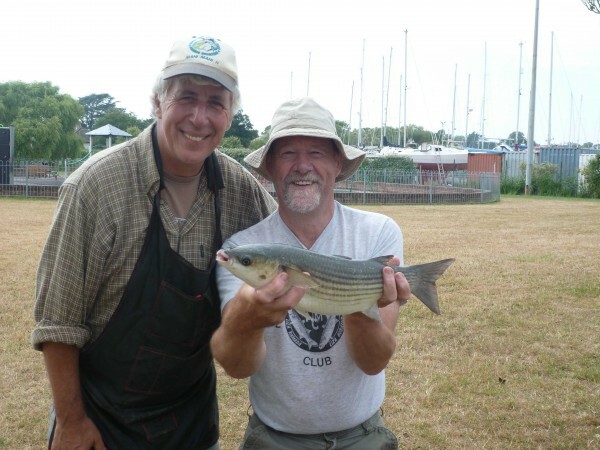 Lastly take a look at this video about the Angling Trust’s mullet fishing master class held on July 7th in partnership with the National Mullet Club. We had such great feedback that more events are being planned for Angling Trust members.